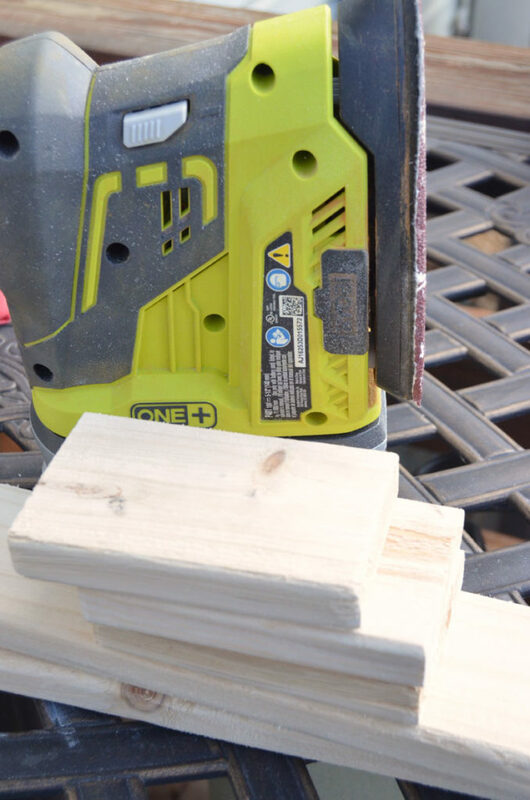 Welcome to a special edition of the Power Tool Challenge. 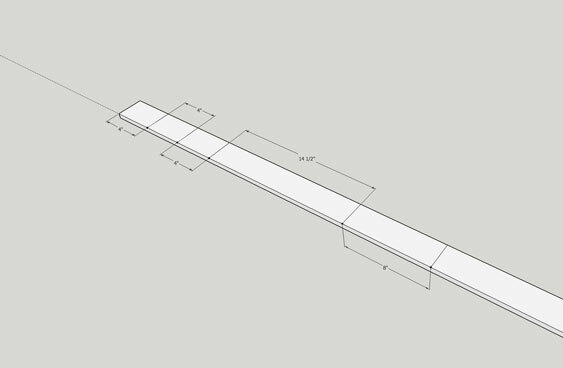 This month’s challenge is to build something for $10 or less. 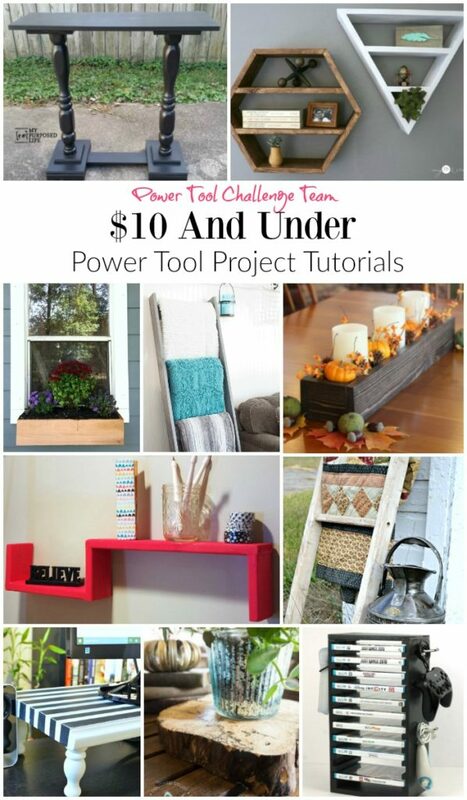 I will show you how to build S shelves for under $10 and then you get to show me what you can make for less than $10! 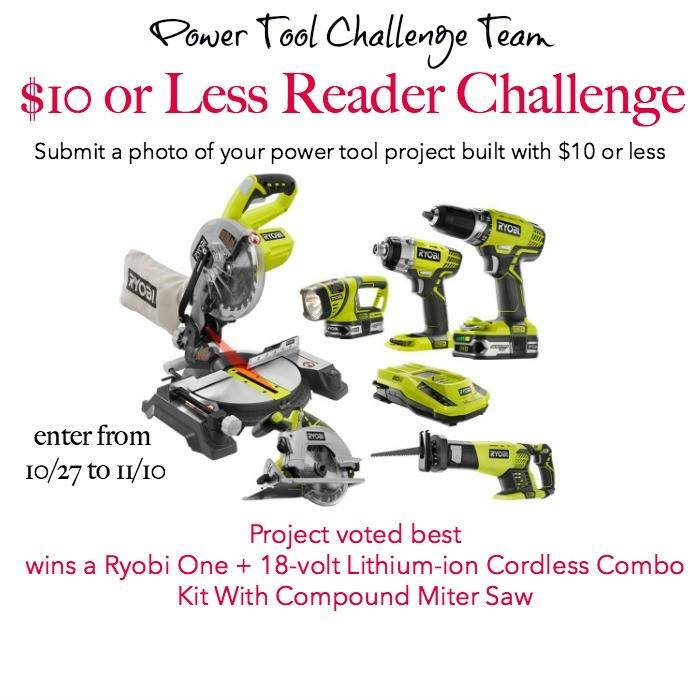 If your project is chosen as the favorite by the Power Tool Challenge Team, you will win a fabulous power tool package from Ryobi Power Power Tools. I’ll have more details at the bottom of this post. 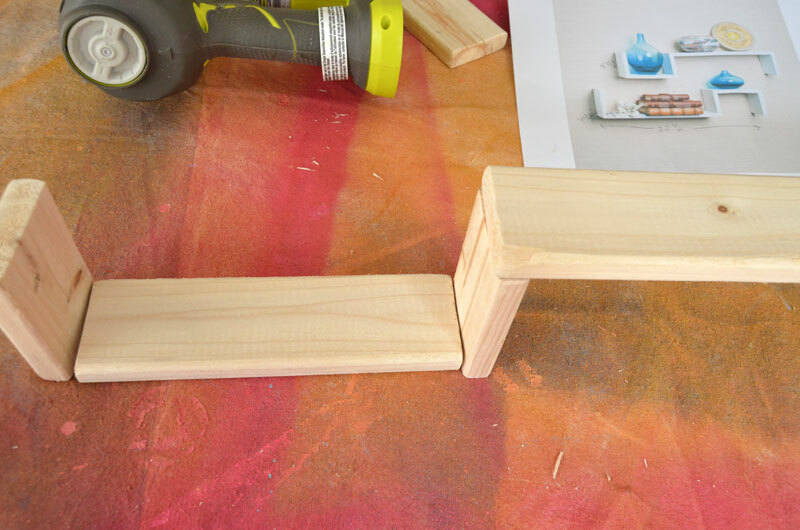 To make these shelves you will need a 1″ x 3″ x 6′. I used a cheap one that I already had in the basement. It’s not one of the “prime” boards so the edges are rounded and the finish is kind of rough. You know the ones I mean. I could have gone out and bought one of the “prime” boards, but decided to just use what I already had on hand. 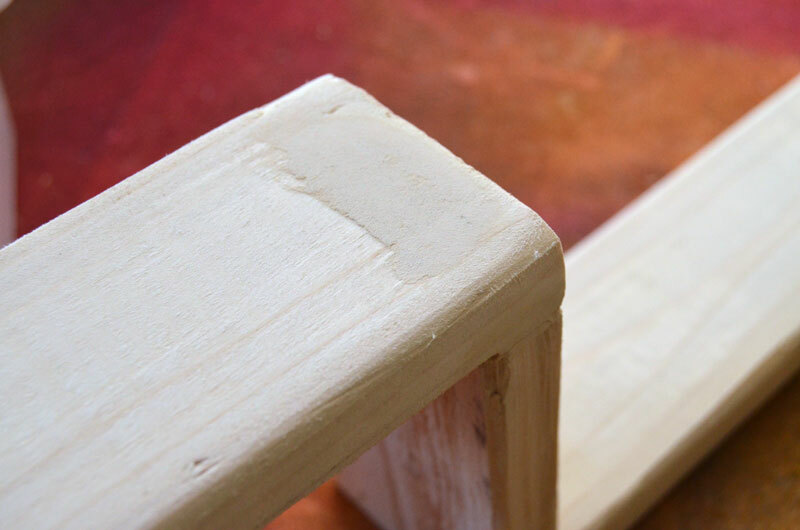 I just sanded a lot and used a lot of wood filler to give them a smoother finish in the end. But we’ll get to that. First we want to cut the 1″ x 3″ down. 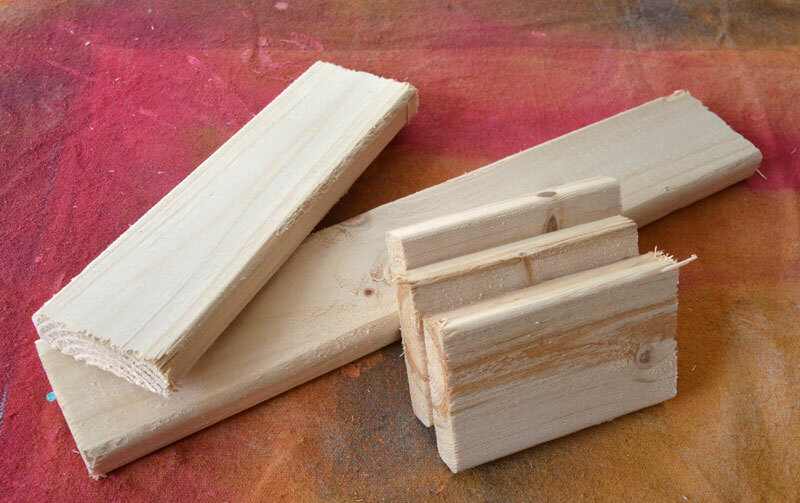 You will need to cut the board into three 4″ lengths, one 8″ length, and one 14-1/2″ length. Now sand those pieces smooth. 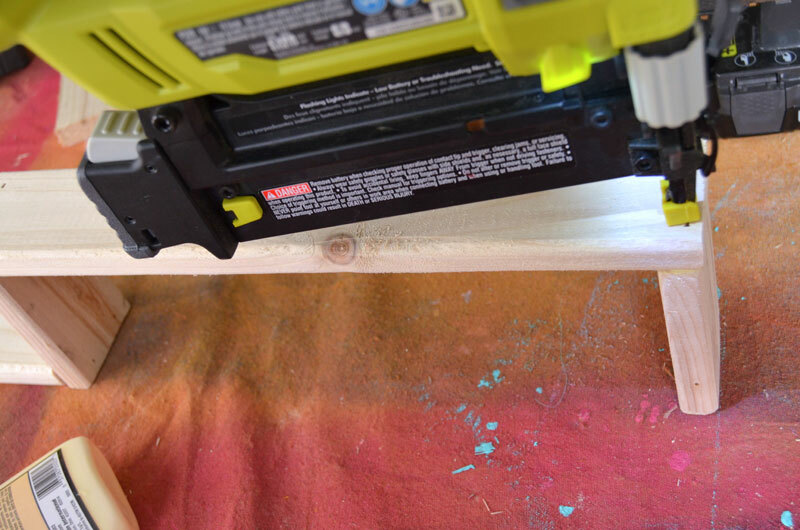 I used my Ryobi sander. Dry-fit the pieces together to form the shelves. 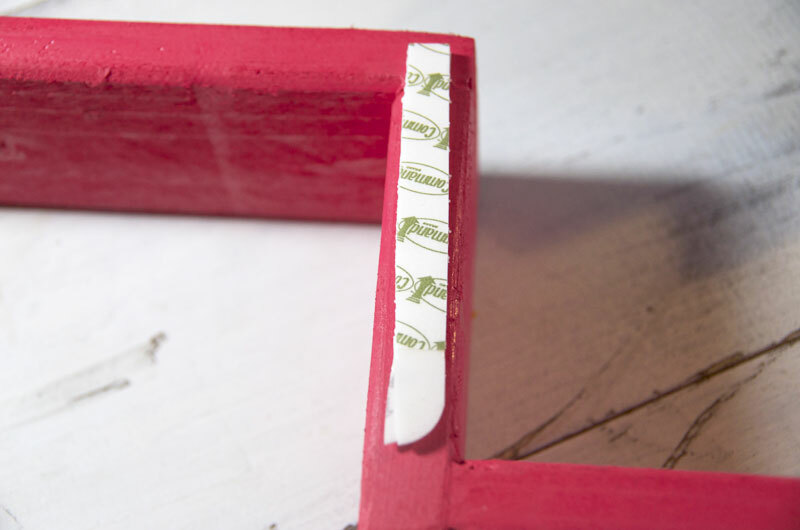 Attach the pieces using wood glue and brad nails. 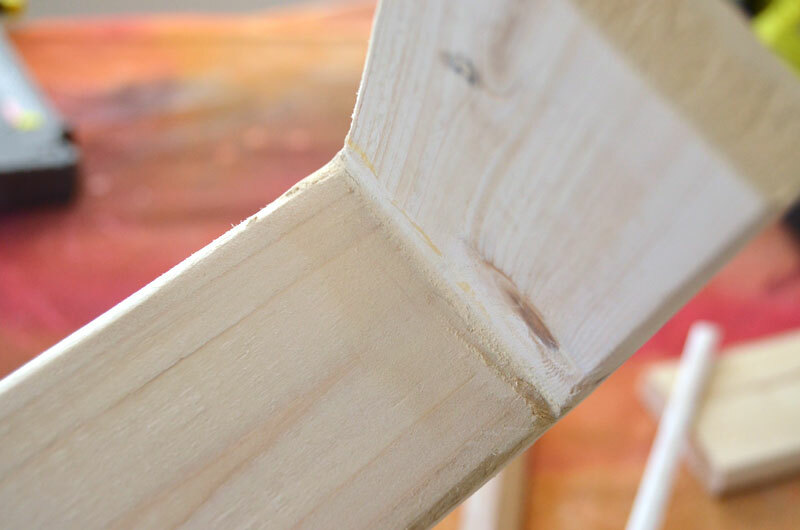 Fill the holes, seams, and gaps with wood filler and allow to dry before sanding. Sand entire shelf smooth before painting. Now it’s time to paint. I used one of my favorite spray paints: Amy Howard Furniture Lacquer. This stuff is the bomb. You’ve seen me use it in the laundry room makeover on the cabinet and my all-time favorite painted furniture piece: the sewing desk. I had just a little bit left from those two projects – just enough for these two shelves! I’m in love with that color: it’s called Begonia and I think it’s so bright and pretty! TIP: I just have light-weight items on my shelf so I hang it up using Command Strips that I cut in half length-wise so they wouldn’t show. Pretty cute, right? I love having that bright, fun pop of color next to me as I sit at computer. At least one power tool has to be used to build it. What a great shelf idea! They look great “opposite” hanging on your wall. Very clever! So creative!! I love the color and shape – fun storage idea! Pinned! These are super fun, and so creative! I love the pop of color too! 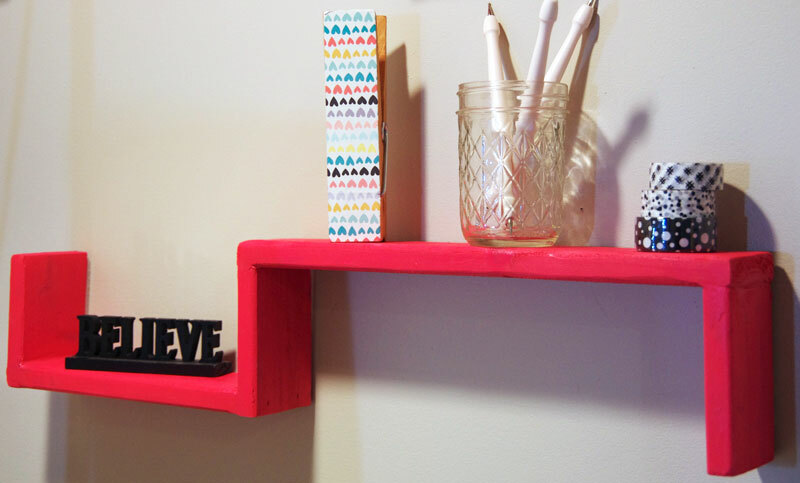 I like the interesting layout you used for your DIY shelves and of course the pop of red (being my favorite color). One of these would be perfect for my grandson’s room! 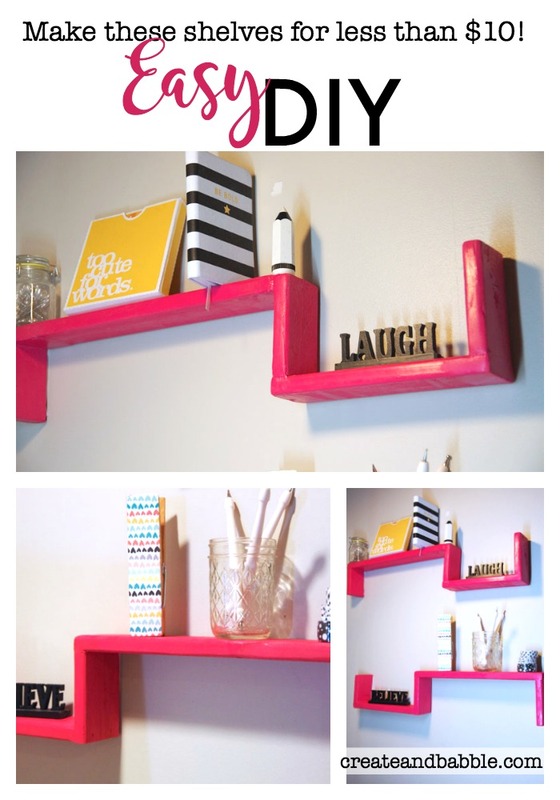 I love the fun design of these shelves and really love their hot pink color. Hanging them with command strips is a great tip! Jeanie, How clever! They turned out great and I love the idea of filling your crack lines with filler. this looks great, and actually reminds me of those shelves for cats to “get vertical” with their space. lol. Such a clever design! Great pop of color too. Great tutorial. Thank you for linking up with us at #HomeMattersParty . We would love to see you again next week. This would be a great way to use up all my wood scraps. Thanks for sharing this fun project on Merry Monday. 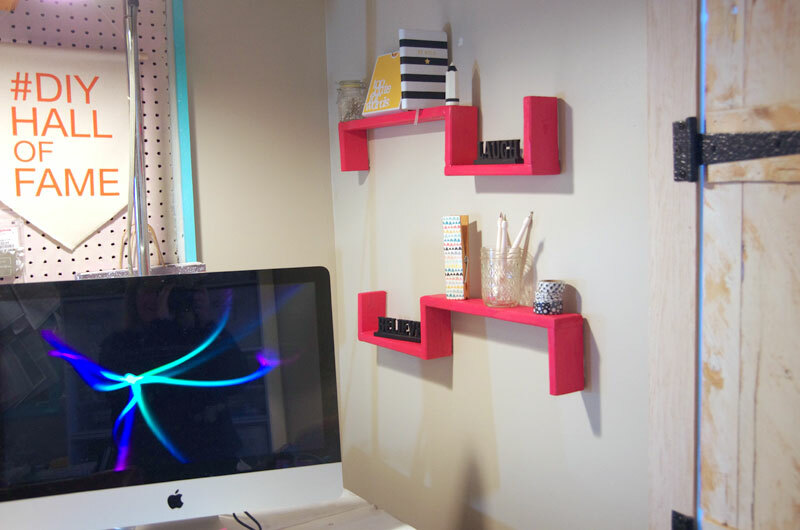 Cool DIY shelves! Thank you for sharing your blog post with us at the #HomeMattersParty this week. Hope to see you link up again when the party opens on Friday at midnight EST! Thanks for your great writeup. It was the activity bill them. Seem innovative to considerably added in agreeable from you! By the way, what exactly is be in contact?